Emerson Fittipaldi was Brazil’s first World Champion winning in 1972 and 1974. He burst onto the scene in 1970 winning the USGP as a replacement for Jochen Rindt. The win clinched the title for Rindt denying the fast closing Jacky Ickx the points needed to overtake Rindt. 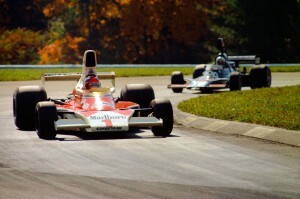 In 1974 he switched to McLaren where he stayed until 1976 when he switched to his own car. Emo won both the CART and F1 Championships and won Indy twice. Here he leads Tom Pryce in the Shadow out of the Anvil at the 1975 USGP.